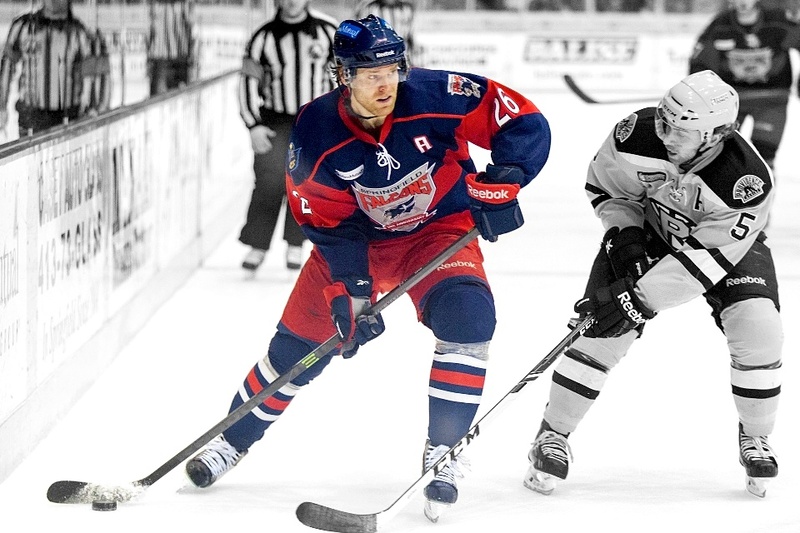 Hello and welcome to a fan made website of the Springfield Falcons, a former AHL team from Springfield, Massachusetts. This website is made by fans who loved the team when they were Springfield Falcons and would like to see them get back to their home at MassMutual Center. We realize that the chances for something like this happening are pretty slim, so this website is more a homage to a great team, which called Springfield their home for a very long time. I’m very sad that the team left Springfield. Them leaving left a huge hole in our hearts and this website is our way of saying thank you and showing the team that they still have fans here in Springfield. Springfield currently has another AHL team, Springfield Thunderbirds, which relocated here from Portland, just this season. It’s I guess better than not having any team, but again, it’s not the same like it was with the Falcons. I actually purchased a digital camera and a small portable drone just before the announcement was made that the Falcons were leaving Springfield. I did that in the hopes of recording a training session (I know some people) but I never got around to actually doing it before the team left. I don’t know this new team that well, so I’m not sure I’ll be able to use the gear I have for recording the Thunderbirds. Also, if you are wondering, I knew one of the coaches and he told me I could record, as long as its good, 🙂 . Though AHL rules are pretty lax when it comes to these kind of things, I might even be able to record an actual match, heh. You can see that I was a huge fan of the team. In fact, in all the years that the team played at the MassMutual I only skipped 3 matches, due to illness. I had a season pass all the way, through thick and thin. By the way, I realized that I haven’t introduced myself. My name is Claudia Lewis and I’m a waitress from Springfield. The other two names that you need to know about are Pete Carter and Ron Pratt. These two are the reason why this website exists. They are also huge fans of the Falcons, but they also have jobs in IT which is the reason why they are in charge of the website. I just provide the text. I dabble in the geeky stuff, but not to the extent that Pete and Ron do. I’m a huge photography buff. In my spare time you’ll usually find me playing around with cameras, photography drones, tripods, lighting gear, etc. But enough about us, let’s talk about the real star of the show, the Springfield Falcons. Team that I grew up with and that I’ve known as the Springfield Falcons was actually founded fairly recently, back in 1994. Falcons were founded by Bruce Landon and Wayne LaChance. Landon was a member of Springfield Indians, another AHL team that predated the Falcons. Springfield Indians was founded all the way back in 1926. They went through several name/affiliation changes until the team was ultimately sold and moved to Worcester, Massachusetts in 1994. 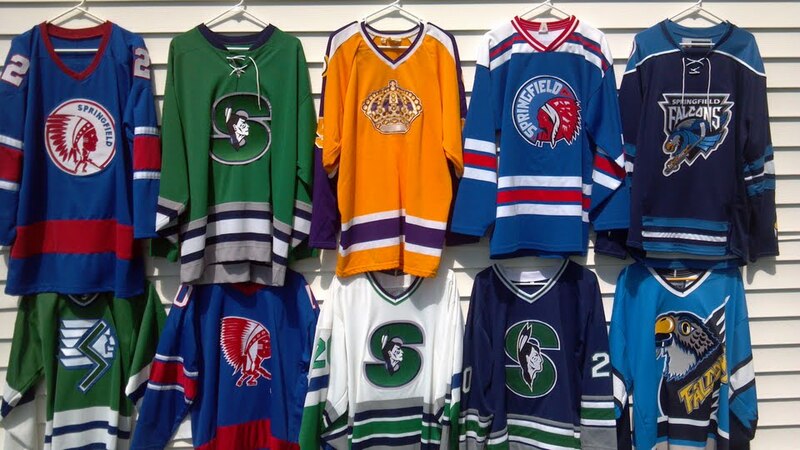 It’s no surprise that there were name/affiliation changes, the original team was after all active for over 60 years. Indians however ended up being sold to Worcester and Landon took it upon himself to launch another AHL team in Springfield. It was lucky for us he did that, because that’s how we ended up with Springfield Falcons. Newly created Falcons also changed their NFL team affiliations numerous times over the years. You know how things go in the business. They were affiliated with Winnipeg Jets, Hartford Whalers, Tampa Bay Lightning, Edmonton Oilers and Columbus Blue Jackets. 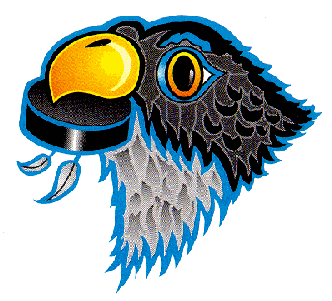 Winnipeg Jets, one of the first teams that the Falcons were affiliated with, are actually the team that bought and relocated Falcons. Jets themselves were in the meantime sold and relocated to Tuscon, Arizona where they became the Arizona Coyotes. Falcons are now known as Tuscon Roadrunners. 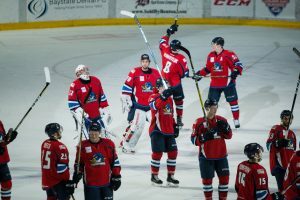 In their almost 20 year long history as Springfield Falcons, the team had several spurts of good standings in their division. First it was from 1996 through 2000, when they actually ended up being either 1st or 2nd in the North/New England division. Second renesaince that the team had happened between 2012-2014, when they once again reigned in the Northeast AHL division. 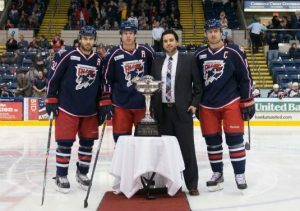 Many different cups were also won during the club history, including the Calder Cup back in 2012. Team has won, or maybe I should say individual players have won multiple awards over the years. Awards that the team has won include Baz Bastien Award for the best goaltender (won by Legace in 1996 and Langkow in 1998). Briere won the Red Garret Award as a rookie of the year, as an First Team All-Star center in 1998. Trudel won a Second Team All-Star award in 1999 and Tiley won the Eddie Shore Award for amazing defence performances in 2000. For such a small team the players have racked up quite a number of awards and achievements. Watching them play was really something else. Just have a look at the video posted to the right. It’s a game against the Hartford Wolf Pack from 2013. Now all the fighting aside, this game is a great example of the quality that the Springfield Falcons had. This video was made before video drones were very popular, so I couldn’t make the kind of video that I wanted to create with my drone that I bought, but it still paints a great picture of the kind of quality of game that the Springfield Falcons could deliver. Well like I already mentioned, Springfield Falcons have left Springfield, but they do still live on as Tuscon Roadrunners. Technically speaking the team still lives on in Tuscon, but it’s not the same for me or anyone in the team here when we cannot visit the matches. Flying practically across the country just to watch a game, even if its just a couple of times a year isn’t really a reality for us. All that’s left for us is to keep showing our support to the team, and hope that one day they are going to come back to Springfield. They can’t come back to MassMutual, since that’s where Thunderbirds are, but who knows, maybe the Thunderbirds will leave Springfield and we will get Falcons back. I realize that the chances of that happening are pretty slim, but hey, a girl can dream, can’t she. 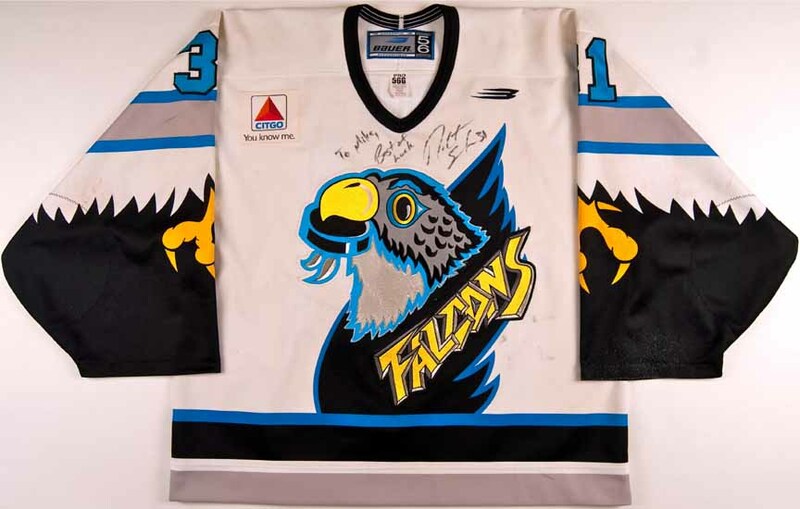 In the meantime the Falcons AHL website is here to provide you with nostalgia and we will try our best in trying to convert to being full-on Thunderbirds fans. It’s not easy forgetting about the Falcons, but we are open to the idea of accepting other teams into our hearts and many of our fellow citizens have already taken up to Thunderbirds. If you want to get in touch with us, you can use this contact form. Our personal emails can be found on the contact page. Cheers.